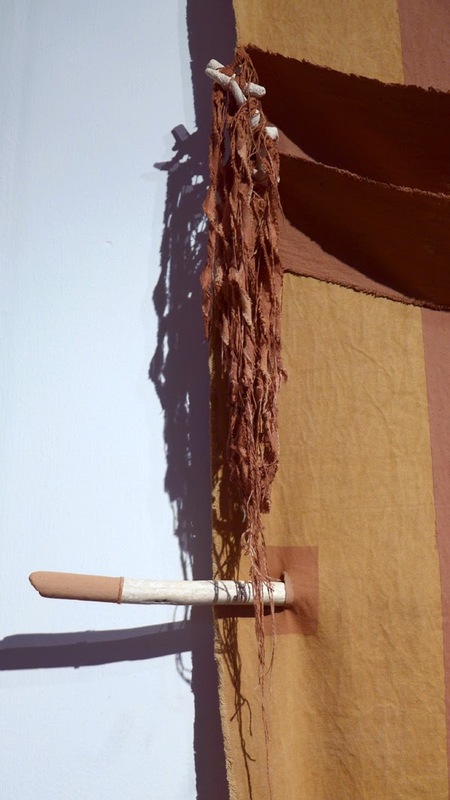 Currently on show at Studio Naenna's gallery is a display of sculpture for the wall, or 'architectural functions in textile', as the invitation provocatively states. 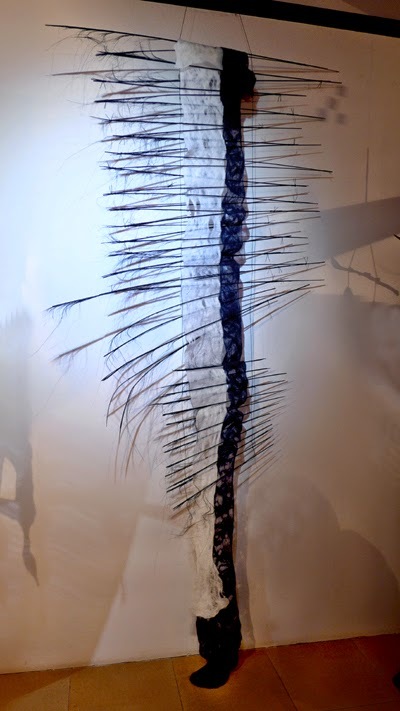 Comprising sticks, seed pods, mud-dyed woven hemp, felted wool, silk, and using natural dyes, the exhibition lives up to its title: 'Voice of Nature'. 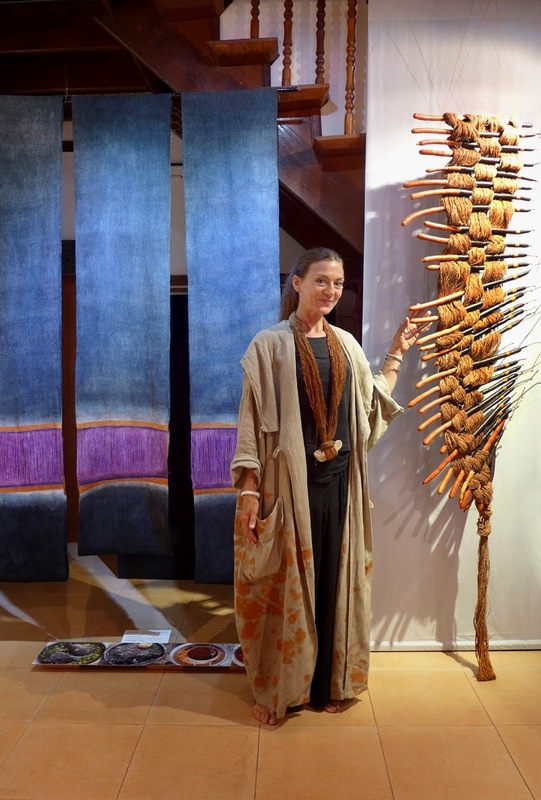 Alfa Hugelmann, the artist, has created these pieces during her artist-in-residence tenure at Studio Naenna and has made good use of the strengths of this famous Chiang Mai textile resource. 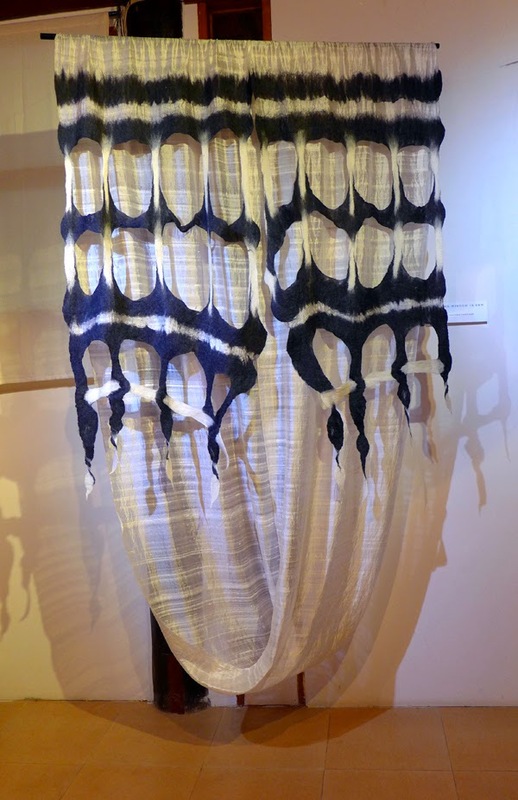 Her use of natural dyes is fresh and creative: especially interesting are a trio of continuous-warp hemp weavings which she has dyed with indigo, orange, and finally purple on the open warps, allowing the background to peek through. 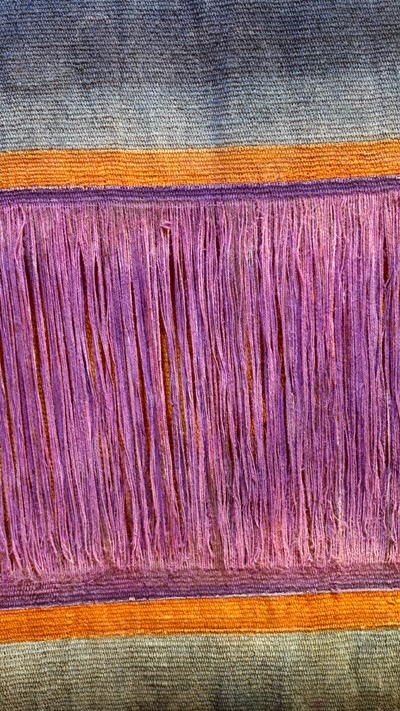 Several pieces utilize woven hemp with a continuous-warps; such textiles are often considered sacred in parts of the world that still find meaning and power in textiles for ritual use. She honors this concept with her thoughtful use of natural color. 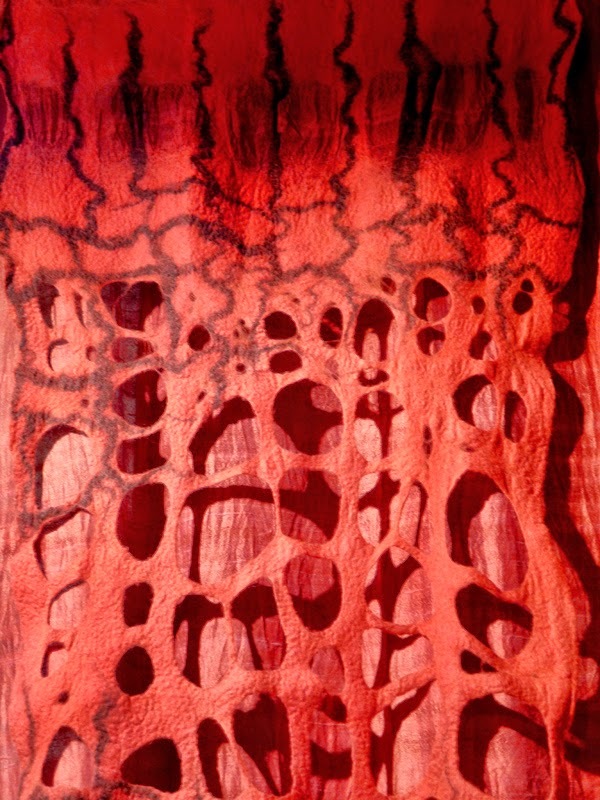 Brilliant red from sappan wood colors some panels of silk overlaid with felted wool in a loose grid, and rich grey felted wool contrasts handsomely with white silk that becomes silvery under lights. 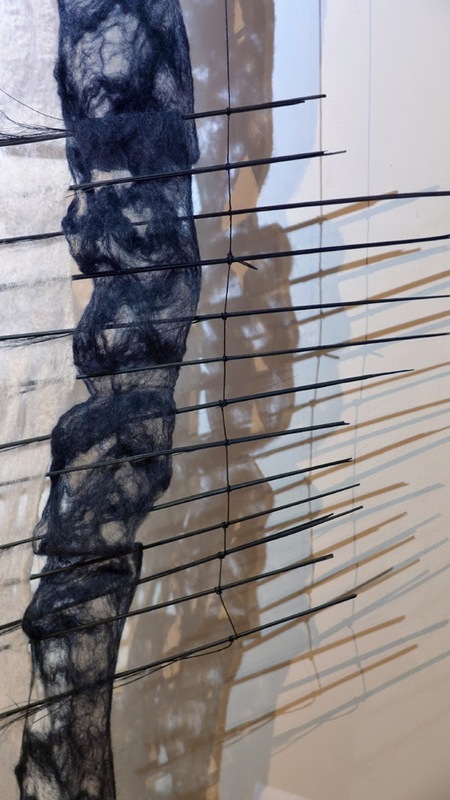 Several of the pieces were designed to not just hang on a wall, but to move with the slightest breeze, creating shadows and shimmers that enliven the space. 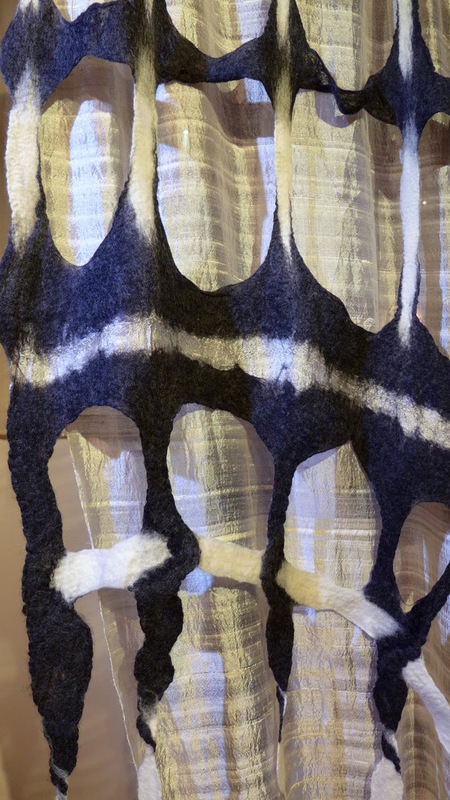 Her use of felted wool is a surprise here in the tropics. Brought from Europe, the wool has been dyed with natural color and in another piece is combined with slim black sticks in different lengths. 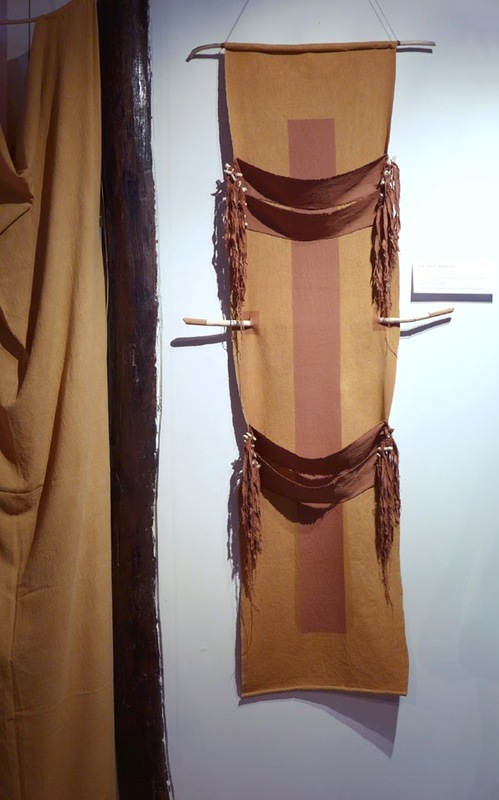 It evokes many things: from a backbone and ribs, to a native American ceremonial chest plate. The shadows created by its movement are an added visual bonus. 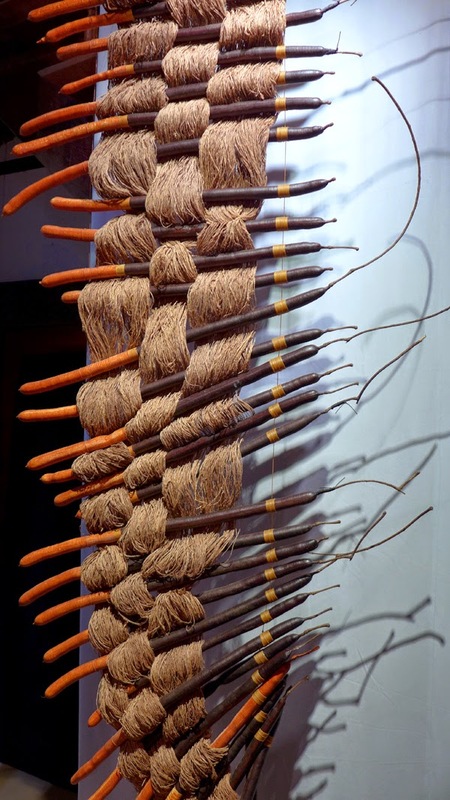 Another piece incorporates long seed pods which form the weft for a warp of thick threads bunched together. It's natural, tribal, and architectural all at once, as well as being quite sculptural. Alfa shifted gears a bit, and geography, with a trip to Africa and the result is a handsome, mud-dyed piece with tribal resonance. 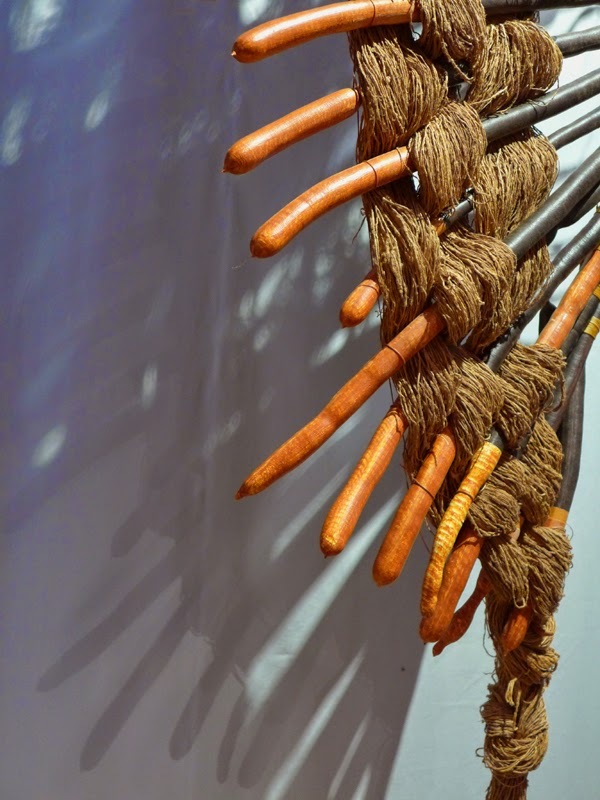 In keeping with her theme, it incorporates natural elements of sticks and odd bits of bone, in addition to the beautiful 'terra' coloration. 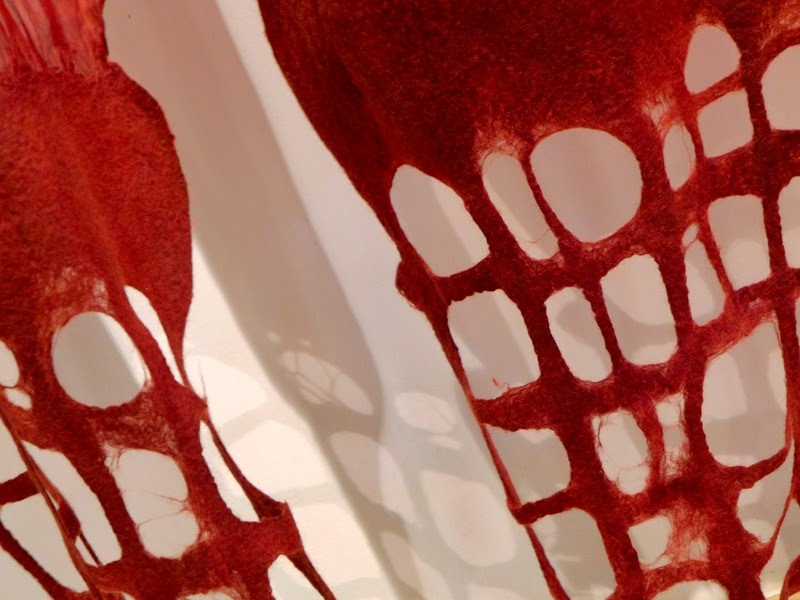 Although small in size, the gallery is full of inspiration with this 'mixed-media' show: fresh use of materials and coloration is the major theme, and the viewer leaves with new thoughts on the idea of textiles for display, the space they inhabit, and meaning imparted. This was a welcome jolt out of our usual textile world. The exhibition will continue on Saturdays from 10am - 3pm, or by appointment (085/707-7008), through 16 August at Studio Naenna Textiles Gallery in Changkhian.